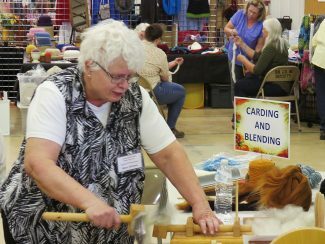 Mary Whited, left, shows a participant how fiber is blended during the carding and blending demonstration. Mary Whited demonstrates wool blending. Libby Lundgren, right, demonstrates how to use the rigid heddle loom, while Diana Steffens, sitting, of Sidney, Neb., watches. 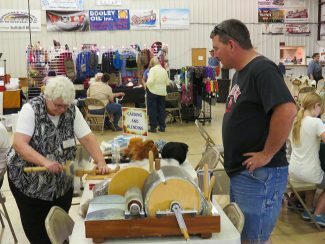 Gerry Kay Walrath of Sioux Falls, S.D., left, and Mary Vogel of Powell, Wyo, demonstrate the fine art of wool spinning. 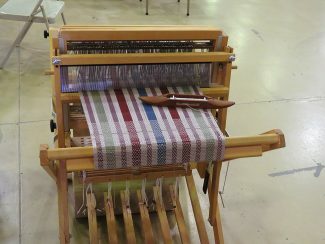 A harness loom was on display at the Fiber Fair. 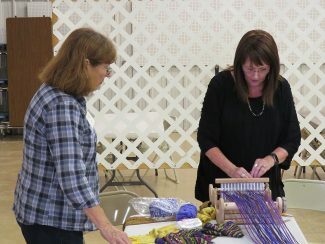 Christine Thomas, left, watches instructor Deborah Jarchowof California weave using a rigid heddle loom. It was a tranquil scene. 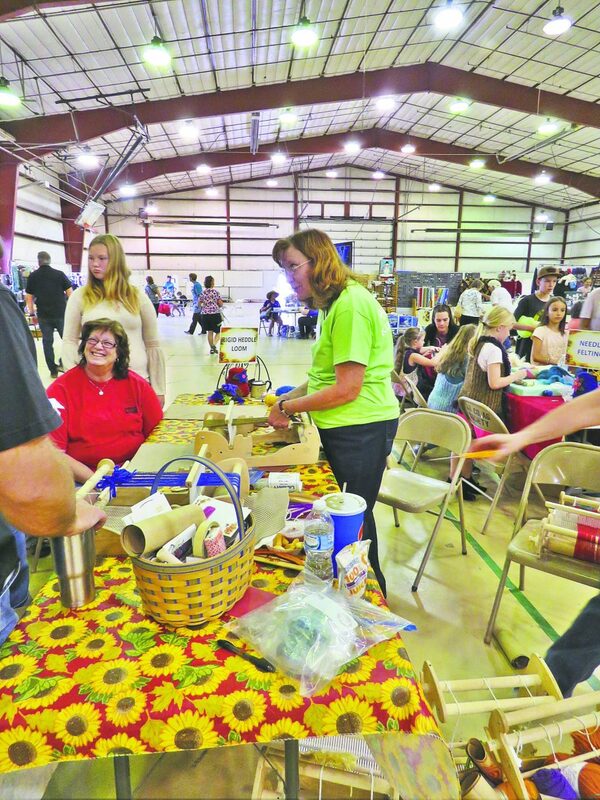 A group of fiddlers serenaded the room, while participants wandered from one display to the next looking at bright, colorful yarns, rugs, crafts and other wares. 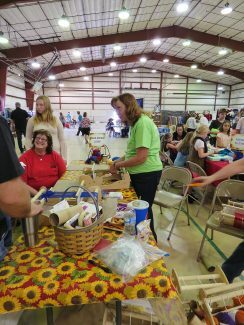 In the midst of this scene, were dozens of artists showing participants how to make the brightly colored fiber into shawls, scarves, clothing and rugs, among other crafts, using the old art of spinning wheels and looms. 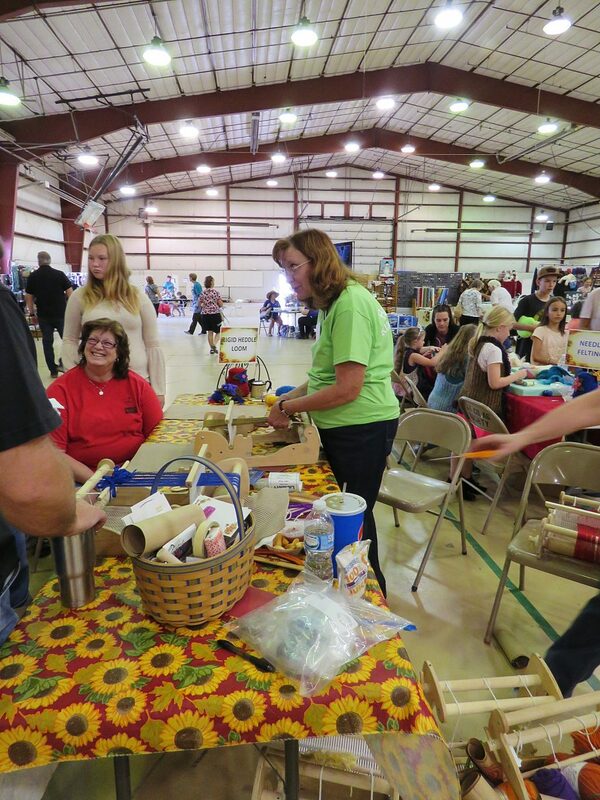 In a separate area, participants could view the animals that make wool and fiber, such as sheep, alpacas, llamas, angora goats, yaks and rabbits. The owners of these animals were on hand to answer questions about their animals, and how the raw product becomes vibrant yarns. This year marked the ninth anniversary for the Scotts Bluff Valley Fiber Arts Fair, which was held recently at the Scotts Bluff County Fairgrounds in Mitchell, Neb. Participants not only visited 30 vendors set up in the marketplace, but had the opportunity to watch demonstrators card and spin wool and fiber, then felt, weave and craft. Classes in different fiber arts were also offered by artists from all over the United States. Peggy Wells of Brown Sheep Company in Mitchell coordinates the event. 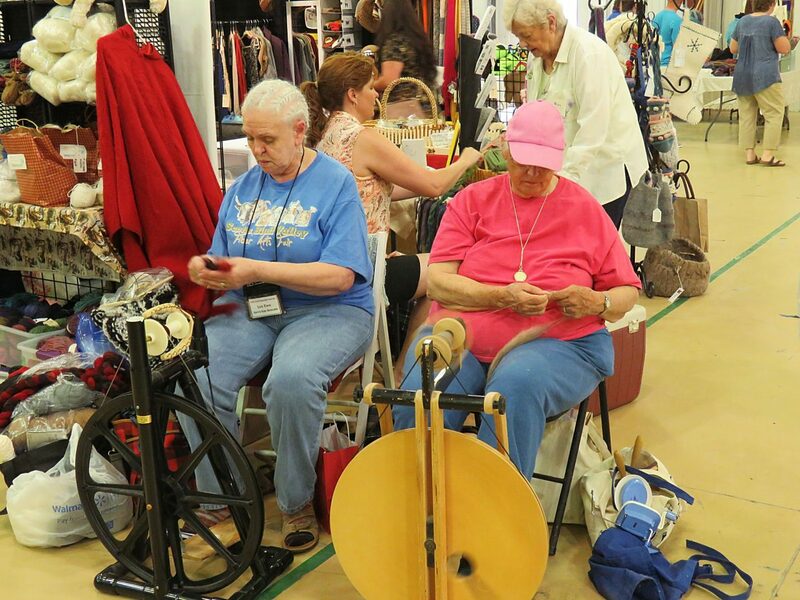 While the fiber fair gives viewers an opportunity to participate in an old world art first hand, it also inspired people to discover and cultivate their talents for creativity with fiber. It is also an opportunity to learn the history and importance of fiber and textile arts in our society, and allows demonstrators to share new techniques and project ideas. 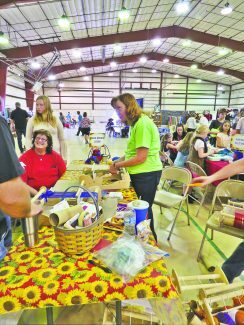 "It is something I really like participating in," said Katrina Tylee of Mitchell. "It is fun to talk with the many people who happen to enjoy the same things I do. Plus, I get to spin wool for three hours. It's a lot of fun." Tylee competes in the Sheep to Scarf contest held during the event, in addition to setting up a display in the marketplace. Tylee has a store, Little Hawk Yarns, in Scottsbluff, Neb. 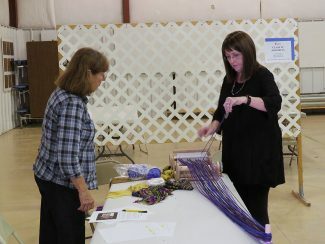 During the two-day event, classes were held teaching students how to blend colors on the loom, make lattice lace scarves, traditional rug hooking, wagon wheel rugs and needle felting, just to name a few. Students could also take part in learning how to spin fiber on a spinning wheel or on a drop spindle. During the fair, participants also had the opportunity to tour Brown Sheep Company, and learn about dyeing wool while they were there. Cher Maybee of BarnAnew, was excited about the artists at this year's event. "The fiber fair hosts nationally known artists, authors and teachers of the fiber world," she said. 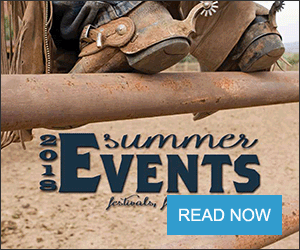 "These individuals bring with them talent, creativity, passion and knowledge to share with those who choose to participate in the Scotts Bluff Valley Fiber Arts Fair and classes." One of the highlights of the two day event is a Sheep-to-Scarf contest where teams of five have three hours to produce a finished scarf from raw fleece. The competitors have to provide their own raw fiber from sheep, llamas or alpacas. The wool can be washed before the competition, but not carded, picked, combed or teased. Team members first have to prepare the wool by carding it, before spinning it into yarn and weaving it into a scarf. The scarf must be natural colors when it is completed, and washed before it is presented to the judges. 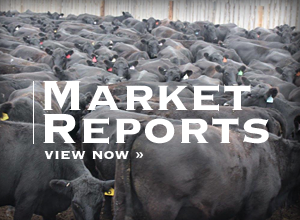 The High Plains Treadlers, lead by Tylee, took first place in this year's contest. The other members on her team were from Gering, Neb., and Guernsey, Douglas and Torrington, Wyo. This was the third time they have competed in the contest. "We met through the fiber fair and social media, and we keep in touch through email," Tylee said. "The only time our team gets to spin together is during this contest, although a few of us that live closer get together to spin more often." The event requires a lot of organization, Tylee said. "We have to bring our own fleece from the sheep, and the only thing we can do is wash it beforehand," she said. "We can't even pick the vegetable matter out of it. Everything has to be done during the contest. 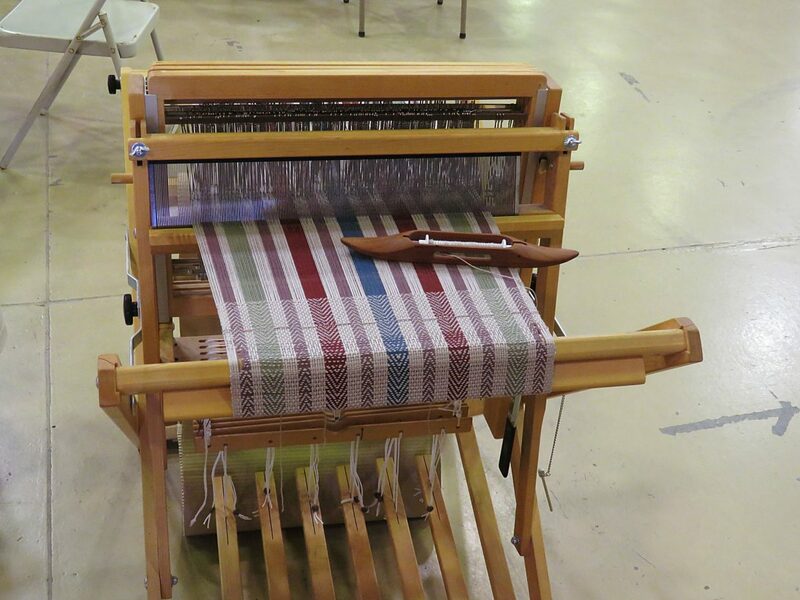 Our weaver did the spinning for the warp, and prewarped and picked the pattern we would use for the contest."